A large crowd assembled at Toronto’s upscale Yorkdale Mall to welcome the iPad 2 as it made its official Canadian debut at the Apple Store there on Friday. By 3:30 p.m. the line had reached approximately 150 people—some of whom had lined up overnight in the face of sub-zero temperatures—with more hopefuls continuing to arrive in anticipation of the 5 p.m. launch. 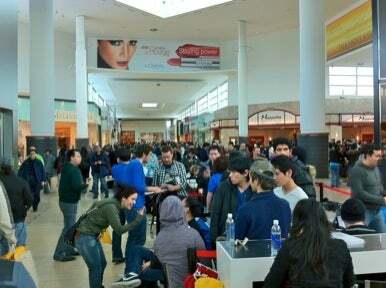 Would-be iPad customers wait for their chance to buy a new tablet at the Yorkdale Mall in Toronto. Ling Yang, of Toronto suburb North York, was waiting to purchase her first iPad—a white 32GB Wi-Fi only model. “I use my Macbook to take notes in class, and this looks so much easier to carry around,” she said. 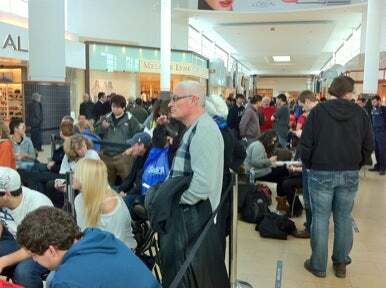 With some exceptions, the scene at Yorkdale was similar to the one that played out throughout the U.S. on March 11 and at UK stores earlier Friday; since Apple had not taken any reservations, every customer was queued in a single line and eventually handed a ticket that would ensure that the devices of their choice would be available when they finally made it inside the store. As is customary at these events, Apple Store employees were on hand throughout the day to field questions, marshal the crowds, and hand out coffee, bottled water, and chairs—yes, chairs. Apple Store staff was on hand to provide guidance, drinks and chairs. On Friday, Apple Canada also begun taking orders for the iPad 2 through its Website, with prices starting at $519 Canadian and delivery estimates of two to three weeks. By midday, the wait times had grown to three to four weeks on all models, which include black or white Wi-Fi-only and Wi-Fi + 3G GSM models; the latter, according to the company, will work on all the major Canadian cellular providers, provided that customers purchase the appropriate SIM card. Interestingly, Apple is not selling a CDMA model, despite the fact that at least two of the primary national networks use it.